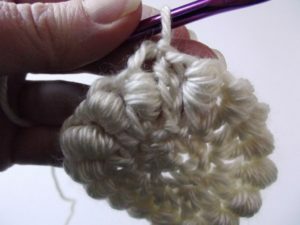 The crochet bullion stitch, also known as the roll stitch, may seem daunting at first, but it’s really not that hard to learn. 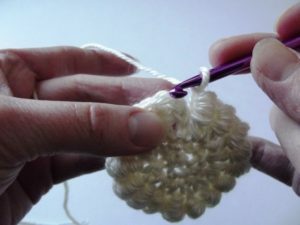 All it takes is a bit of patience and a few tips & tricks and you’ll have this stitch mastered in no time. I promise. Of course, you’ll have to find your own way of doing it, but I promise you that you can do it. I still havn’t quite mastered this stitch, but it does get better with practice. I find the hardest part now is to keep the stitches at the same tension and height. 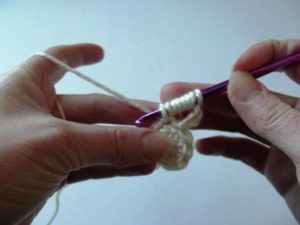 One of the keys to making a bullion stitch lies in the yarn. You don’t want to practice with a yarn that frays easy. This tutorial was done with a yarn that frays easy, but I have found that Red Heart Comfort, Red Heart Super Saver and Loops and Threads Impeccable work fairly good in making the stitch. I’m sure there are many other yarns that will work great, but those are a few that I’ve experimented with. To begin your row or your round, make a series of chains. The number all depends on how many times you decide to wrap your yarn. In this case, I made 3 chains. 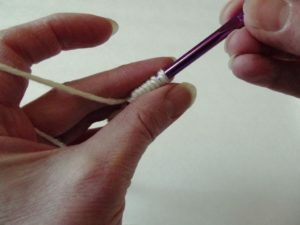 Step 2: Wrap your yarn around the hook loosely. 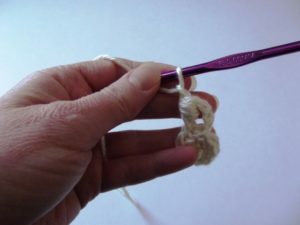 Depending on how high you want the stitch, you can wrap it anywhere from 4 to 10 times, or whatever the pattern calls for. In this case, I wrapped the yarn 6 times, for a total of 7 loops on the hook. Step 4: Wrap the yarn over the hook and pull through. You now have 8 loops on your hook. And as you can see, all the loops are nice and loose. 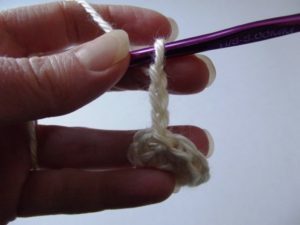 Step 5: Wrap the yarn over again and pull it through all the loops on the hook. This is the tricky part, but it doesn’t have to be hard. My trick is to hold the hook so the point faces down and the hook is held at a downward angle. 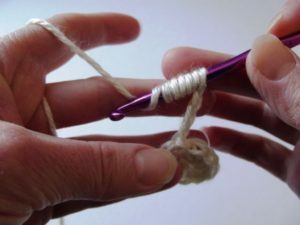 Step 6: I continue to hold the hook at a downward angle as I move the left thumb and middle finger around the loops to hold them. 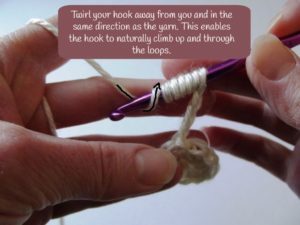 I then gently push the loops down to the end of the hook, BUT I don’t push them off. I let the hook do the work. My trick is to twirl the hook in the direction of the yarn and gently tug and twirl until it’s through. Most times 2-3 twists in the hook is all you need, but sometimes it can go up to 4-5 times. 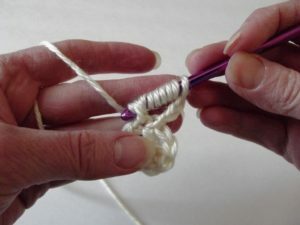 This is the image that was used in Step 2, but it best depicts the direction of the yarn. The trick is to twirl the hook so it travels back up in the same spiral direction of the yarn. And if the loops are loose and neatly on the hook, you’ll have no problem pulling it through. Step 7: This is what it looks like after you’ve pulled it through all loops. The only thing left now is to chain 1 to secure the stitch. 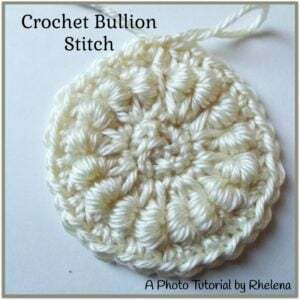 To join the bullion stitch in a round, you want to make the join at the top of the first bullion stitch, and not into the ch-3. Here the join is complete. I pulled the loop open a bit so you can see the join was made directly above the the stitch and all three chains are left untouched. It’s kind of hard to tell from the image above, but the bullion stitch creates an illusion that two stitches have been made: You have the space directly above the stitch, which was created when you pulled the yarn through all those loops. 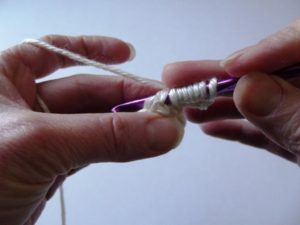 And then when you made the chain 1 to secure the stitch, you created another space. 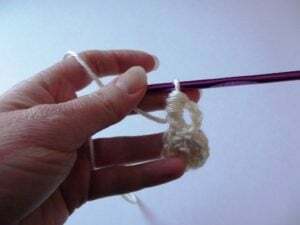 If working in an even pattern you can safely work a single, double or triple crochet into each space created above the bullion because the bullion takes up the exact same width as two of those stitches. However, if you were to do an even row of bullion stitches directly above, you would work only into the first space. This tutorial has not been edited by anyone other than myself. So if you find any typos, or have a suggestion or a question, please leave a comment below. Thanks alot the tutorial is very helpful.